Natto taste test: How does this super-funky superfood stack up? Nattō, fermented soybeans, is one of Japan’s most (or least, depending on how you look at it) popular superfoods. It’s known for its distinct aroma, gooey texture, and funky taste. One of the reasons nattō is good for us is because of its byproduct, nattokinase, which can reduce blood pressure and our risk of cardiovascular disease. It’s also high in vitamin K, which may improve our bone health. Nattō can be purchased at most Asian markets and is either frozen or refrigerated. You can either cook nattō or add it cold to recipes, or eat it straight from its carton after stirring the right amount of times. At Gene Food, we taste-tested three nattō brands for this experiment. Will we eat it again? It’s nattō time at Gene Food, folks. Why am I eating smelly fermented soybeans for breakfast, you might ask? OK, well maybe you aren’t asking that right off the bat. But you will. “It looks like glue with bugs in it,” my best friend said when I told her that John had assigned me to eat nattō for breakfast for three days and write about my experience. I wasn’t familiar with nattō, so I didn’t know if I should be scared or not. It has a reputation for being unpleasant — not a lot of people like the smell or taste. I can get down with some funky, stinky stuff, like kimchi, and I love a lot of Asian food. So how bad could this Japanese staple be? Sometimes eating things that are really good for you requires dealing with a taste that isn’t exactly fantastic. Other times, you get lucky and discover something that’s easy to add to your daily routine. Stick around to find out which category these bacteria beans fall under. Best nattō brand: What does nattō taste like? Verdict: Will I eat nattō again? Nattō is the superfood of Japan. One microbiologist calls it one of the “most potent sources of healthful bacteria there is.” (R) It’s made from soybeans fermented with Bacillus subtilis var. natto. Some people will eat it for breakfast along with some rice, scallions, and maybe an egg. When you buy it at an Asian market, it typically comes in frozen, single-serve styrofoam packs, with soy sauce, mustard, or other flavor packets included. Sometimes nattō is used in other foods, like sushi, miso soup, and Japanese omelettes called tamagoyaki. A quick Google search will even lead to results for nattō bruschetta and spaghetti. Although it is frequently eaten in Japan, not all Japanese people love nattō — it’s more popular in eastern Japan than western Japan, for example. Before we get into our taste test, we need to know the proper way to prepare nattō for consumption. We mentioned the traditional way to eat nattō is over rice, but if you’re just eating it on its own, you need to know what to do with your little frozen styrofoam packs! First, you’ll want to defrost your nattō. You can take out however many containers you think you’ll eat within a week and pop them in the refrigerator. Do this the night before, so you have nattō ready for breakfast the next morning. Then, you’ll pop your containers open. The nattō will be lightly sealed with an easy-to-remove plastic cover, and on top of that will generally be your mix-ins. This can be soy sauce, mustard, and more. Prepare yourself for the waft of aged-cheese smell that’ll hit your face as soon as you lift back the cover on your beans. Nattō looks like it’s covered in goop — that’s the bacteria, and it’ll get even goopier once you begin to stir. Stirring is key to “activating,” and the debate is on regarding how much you should stir nattō. The more you stir, the more sticky and goopy it becomes. I stirred mine 15 times, but some connoisseurs stir theirs … wait for it … a whopping 424 times. There’s something to be said for a quick breakfast, but if you don’t take all that time to stir, nattō is a pretty cheap, nutrient-packed meal at $2 to $3 for a frozen three-pack. OK! We’re ready. Finally. While doing my research on the proper preparation methods, I took a look at people stirring nattō on YouTube and came across a goldmine of fun videos. Nattō is so popular for people to try or dare others to try, there’s even been nattō eating challenges. I didn’t videotape myself, so just take my word for it. These reactions are real. Here are three frozen nattō brands I tried. Pretty smelly, cheesy-stank, with a stringy texture. This was my first try of nattō, and not my favorite. I stirred this one a bit too much because I didn’t know what I was doing, it formed more bubbles, and the stringy goop broke down a bit. The beans themselves taste fine, but the bacteria goop is … an acquired taste. It’s certainly not like eating yogurt. I’ll admit, it took me a while to get past the flavor and smell. I may have rolled around on my couch for a few minutes and whined to my boyfriend, who likes nattō, then reluctantly gone back to the kitchen. The packets of sauce that came with Umainen brand were soy sauce and mustard, which is traditional. The taste (and smell) lingered with me until lunch. This particular brand came with kelp, which actually looked pretty cool once mixed in with the nattō. It was almost as if there was an additional science experiment going on in my breakfast. Little green bits in clear goo floating around in my creamy bean goop. Mmm. But really, I liked the taste of the kelp. I think maybe the soy sauce and mustard just didn’t cut the flavor of the nattō enough in the Umainen brand. This version reminded me more of the seaweed salad I like to eat occasionally with sushi, and I could picture myself making a breakfast bowl out of Kabuto’s nattō with kelp. Finally, this brand seemed a bit lighter than the others. The biggest mystery was what exactly was in this one. The ingredients in English list a variety of stuff in the sauce packet, including radish, sugar, vinegar, mushroom extract, and skipjack tuna extract. But it completely tastes like pineapple. The smell of the sauce plus nattō actually turns this into a pretty welcoming (by comparison) dish! The radish sauce made the beans a lot sweeter, which I wasn’t sure I’d like, and really covered up a lot of the funk. These I could more easily eat. Azuma also definitely had the most sauce to drench the beans out of all brands. It was like a funky fruit cocktail, if you closed your eyes and dreamed! When I saw some of the nattō challenges, I thought that it must be similar to a bitter, wormwood-based liqueur produced in Chicago called Jeppson’s Malört. I’m from Chicago originally, and Malört is one of those drinks you get visitors to try who have never been to the city. A bit of a rite of passage, if you will. It elicits reactions similar to nattō — “baby diapers” was a phrase a friend used after I made a Malört tasting the “trick” during a Halloween party I hosted years ago. Cocktails featuring Malört, when you find something to balance out the bitter flavor, are actually pretty great. Could nattō be the same? After trying it three times, nattō feels like Japan’s Malört. Much like my first taste of Malört, I wanted nothing to do with it ever again at first. The taste burned in my brain for hours afterward. 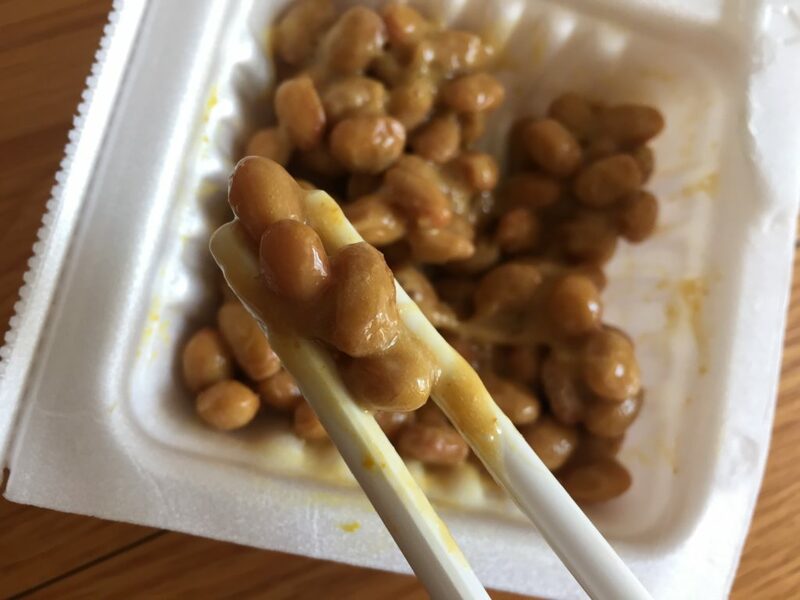 I could smell the nattō on my hands when I took breaks from typing on my computer for work, but I swore that my chopsticks didn’t touch my hands and I didn’t handle the beans directly. Was it seeping through my skin? Then, on to tries two and three. The kelp was second, and much more palatable than the first. Then, the final nattō, with that weird fruity flavor that blocked out most of the funk, was actually decent. I felt like nattō was growing on me. How is this possible? I guess, like some things in life, nattō truly is an acquired taste. After only three tries of it, I could actually see myself using the rest of the nattō in my freezer instead of just staring at the space it was taking up months down the road. Perhaps I’ll try it in a breakfast bowl this weekend, or spread it on a baked sweet potato. Or maybe with a side of Malört? Bifidobacterium vs. Lactobacillus probiotics: what’s the difference? Exercise and the microbiome: can you outrun your gut issues? I found this website while trying to find a local market where I could buy natto. Given that natto has a reputation of tasting like three day old vomit, why would I be seeking it out? Well, it may just be the healthiest food in the world. In areas of northern Japan where it is a staple in women’s diets, osteoporosis and heart disease are nonexistant. Think about that. So I’m willing to give it a shot. This article has given me some information that might make my initial experience a little more tolerable. I hope that’s the case. You can get natto rolls at 7-11 in Tokyo! It’s so normal to eat in Japan. I loved being able to get it so easily when I went to Japan on my honeymoon last year. Now, I drive about an hour to a grocery store that sells organic natto, buy a bunch, freeze it, and defrost one at a time. I usually eat it once a week to get k2 from a plant-based source. That’s a great idea, Amanda! I love the little Asian supermarket by me. Tons of cool finds! Definitely lucky to live near one. Thanks for reading!